My girlfriend gave me a Xyron machine for my birthday this year and I love to use it to apply ultra fine glitter dust. 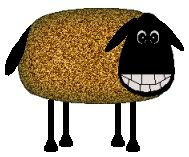 I punched the stars, ran them through the Xyron, which turns what ever you put in it into a sticker, then dipped them into gold glitter dust. The stamp is by Outlines, one of my fav rubber stamp companies. I coloured the trees using Prismacolour pencil crayons then blended with odorless mineral spirits and a cardboard blending stub. A simple, clean card, sometimes that's just what you want! Merry Christmas and Happy New Year to you all! 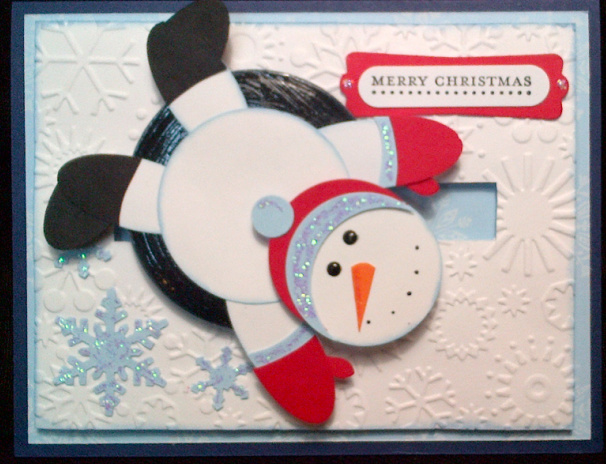 I was browsing over at Splitcoast Stampers a while ago and was inspired to create this card. To create the soft colour on his cheeks I used real powder blush and a make up brush. 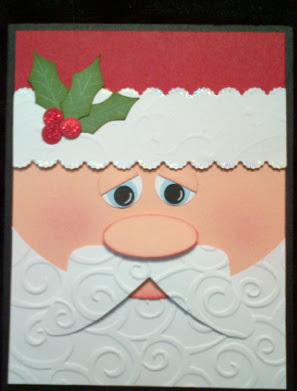 His moustache is half of a die cut butterfly and I made the holly out of ovals after cutting a few 'scoops' out with scissors, then used the tip of my bone folder to create veins. The fur trim is embossed with a swirly embossing plate, I wanted something more subtle so it wouldn't compete with the beard. Everything is better with Stickles, I used Diamond for the fur and red on the holly berries. I love Christmas, and making Christmas cards.... all year round! My mom made this gorgeous pillow for me for Christmas this year!! l can't believe she was able to keep it a secret! I just love it and now you all know where my "crafty genes" come from! It took her 6 weeks to make it and I never saw it once! Those of you who know us, know that my mom lives in a 'nanny flat' attached to the back of our house. so we are back and forth to each other's houses all the time. Thank you mom, I love it and will treasure it. I love you too! 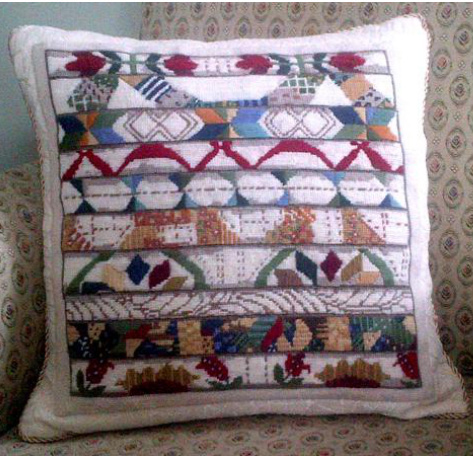 This piece of needlework is a Christmas piece, but I think I'll leave it out all year long. 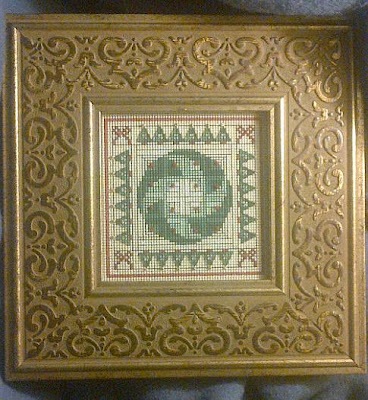 The picture doesn't show it well but it's beaded with seed beads. I like doing pieces this size, big enough to be a challenge but small enough to finish before I get too distracted with other projects. My New Year's resolution this year is to sift though my craftroom, craft storage cupboards, drawers, behind doors and inventory, sort, organize and purge!! I am going to do it with blinders on so I don't get caught up in creating before I finish cleaning up. I've tried to do it several times and I never make it past the first drawer before I find something interesting enough to keep me up until 3 a.m. I'll try and post some before and after photos. Maybe the pressure if having to post it will keep me on task!! Wish me luck and I'll hopefully be ready for a yardsale in a few months! 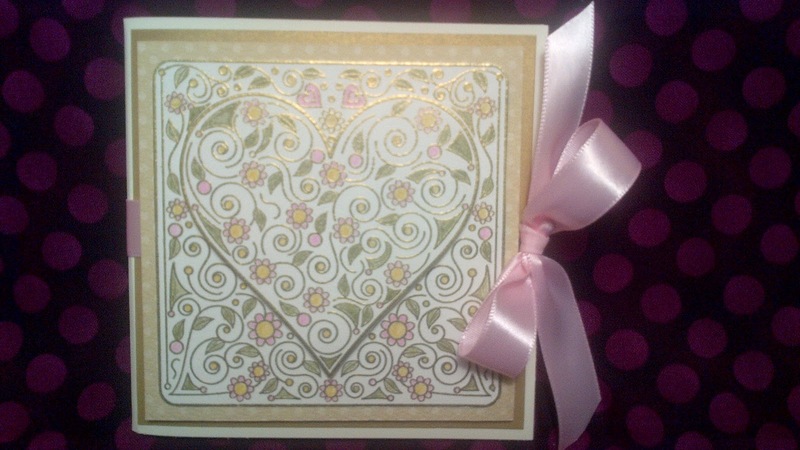 I bought this gorgeous Outlines stamp a few years ago and have been meaning to make a Valentine's Day card with it, hope you like it! Stamp: outlinesrubberstamp.com #H700. 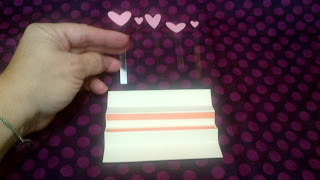 Used the 'gift card slot idea' to create a 'ditch' which holds acetate strips with hearts adhered to tips. 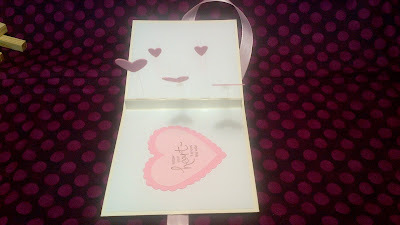 I was going for a floating heart look when the card is untied and opened. Definitely have to use sticky strip to hold the 'ditch' together!! I love Stampendous stamps! 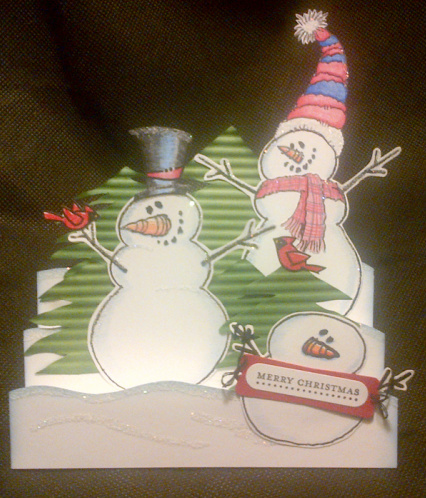 When I bought this snowman set initially I didn't realize that the stamps stretched. It wasn't until I read the package when I got it home and checked out Stampendous.com that I began to understand just how cool these stretchy stamps are! I decided to make a little zigzag card after seeing a similar card somewhere (if I find the source, I will post it - sorry!). 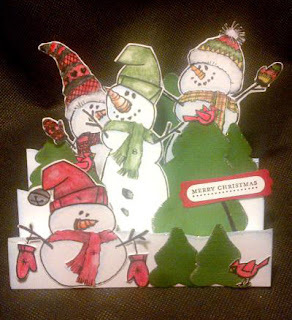 Stamp and colour snowmen and dress them up in their little hats and scarves, I used my Prismas and added stickles. 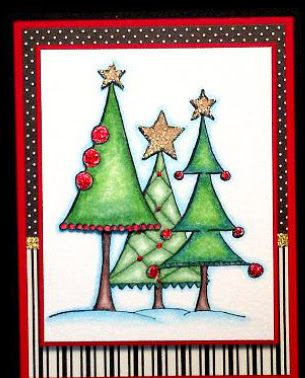 Draw tree shape or use clipart, cut out and run through crimper. I found these two stamps at Heather's Stamping Haven in Ottawa, I think they are both made by Stampendous. 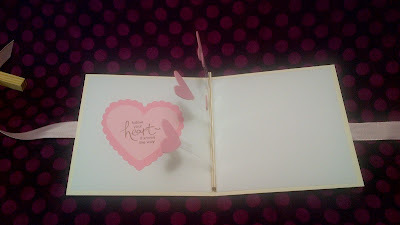 For cardbase: A2 size, 4 1/4" x 51/2", used spellbinder nesting ovals to die cut oval window. Stamp 'Believe' with Versamark and emboss with silver tinsel powder, trace stamp for backing twice, enlarge one tracing to create layer. 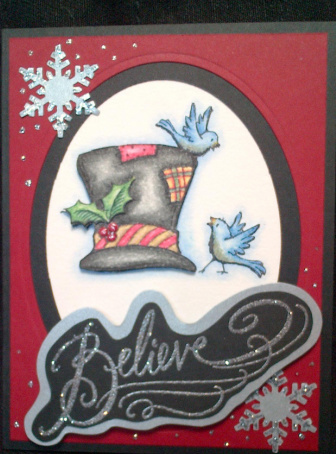 Stamp Frosty's hat black Stazon twice onto water colour paper. 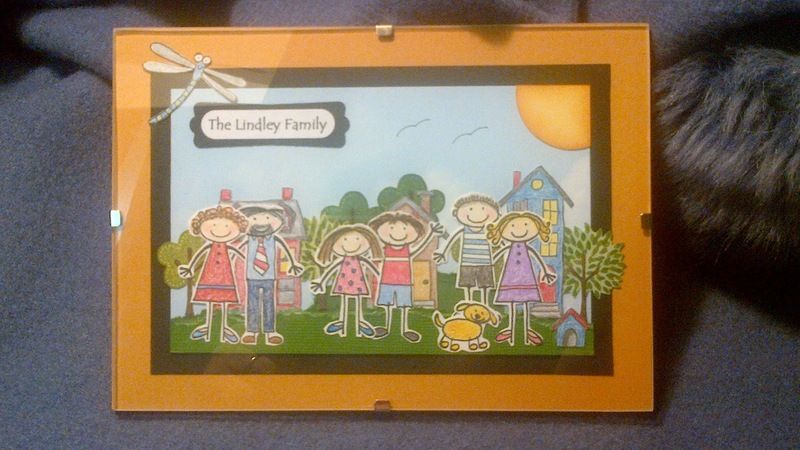 Colour with pencil crayon and odorless mineral spirits, cut out and adhere to first image with low profile adhesive foam dots. 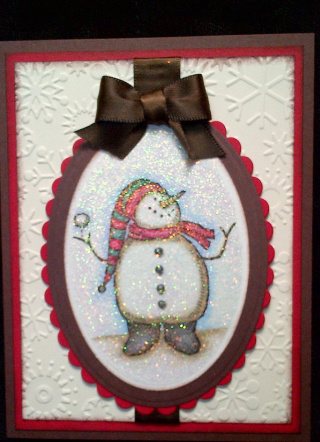 Add some punched snowflakes, and of course everything is better with Stickles on it!